This family style mountain is located along the beautiful continental divide along the Idaho-Montana border, just south of Bitterroot Valley. With a vertical drop of 1,800 feet, it's a great ski area for beginner and intermediate skiers. You'll never stand in line at Lost Trail. 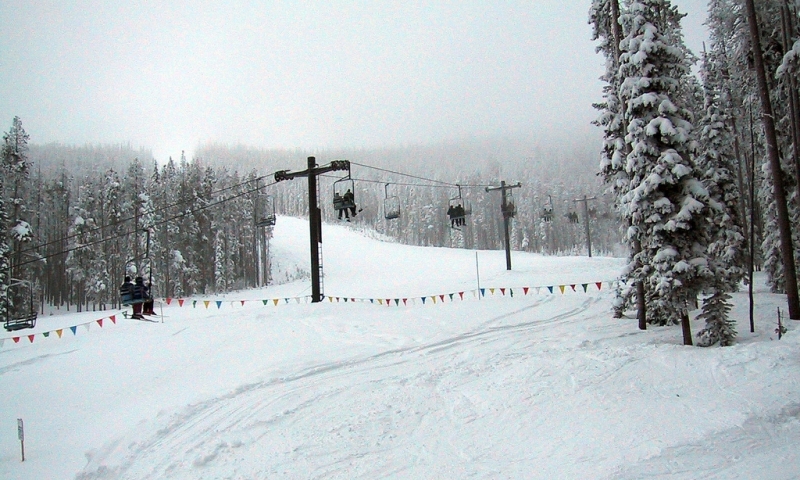 If you are looking for a non-crowded skiing area in the Rocky Mountains, then visit Lost Trail Powder Mountain. Family operated for over 60 years! Where is Lost Trail Powder Mountain? The ski resort is located along Lost Trail Pass on the Idaho-Montana border, at the southern end of the Bitterroot Valley. To get to the resort, head south through the valley on US 93. At the summit of the pass, and the junction with Hwy 43, Lost Trail Powder Mountain sits directly west of road. It's just under an hour drive from Hamilton, Montana. When is Lost Trail Powder Mountain open? The resort is typically open from the first weekend in December through early April. Ski lifts run from Thursday through Sunday from 9:30am to 4pm. The resort is also open for skiing on major holidays including the week of Christmas and New Years, Martin Luther King Day, and President's Day. How much does it cost to ski at Lost Trail? What other activities can I enjoy at Lost Trail? There really isn't much more to do at Lost Trail than to ski and snowboard. The mountain features 2 terrain parks as well as a main lodge with a dining area. You can order everything from soup, sandwiches, and burgers to coffee and beer. Call Lost Trail at (406) 821-3211 or Visit their website.